Jackpot Names: 75 Ball Bingo Games (999Bingo & WinkBingo), Mega Mix Bingo & Wednesday £888! 75 Ball Bingo is the dominant form of bingo played in North America and is a variation of the 90-ball bingo variety. Players opt in to a 75-ball bingo game by purchasing numbered cards in the Studio 75, Ladies First, Morning Quickie, A Quick Bite, Bonus Surprise and some other rooms. A caller calls out numbers randomly and if they appear on a player's card, the player covers them or 'daubs' them. The first player to complete a pre-determined pattern on his/her card with covered numbers wins the game. Mega Mix Bingo & Wednesday £888! - these 888Bingo's games offer "Mega Mix" progressive jackpot with 15 or 11 calls, correspondingly. Play daily at 7pm - 11pm or on Wed @ 10pm. Tickets start at 25p. 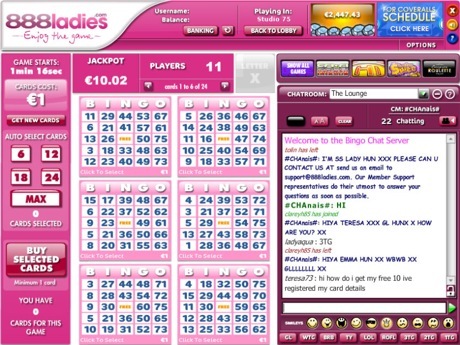 Newbie Bingo - the progressive jackpot is offered by both 888Bingo and WinkBingo sites. It can be found at £888 FREE Newbie Bingo Daily @7am - 10pm at 888Bingo OR at NEWBIES room daily @ 7am - 10pm, FREE £250 DAILY GEMS daily from 19:30 - 23:30, and at Flash Fives OTG room daily @ 6pm-12am at WinkBingo. Gimme 5 - the progressive jackpot is offered by WinkBingo at GIMME 5 all day long, MAGIC MONDAY on Monday @ 9pm, SPARE PENNIES daily @ 7am - 11pm, and at THE SILVER SCREEN bingo room. Ticket costs are offered 4p, 5p and 25p. The Unwind - the progressive jackpot is offered by WinkBingo at The Unwind bingo room daily @ 4PM-12AM. Tickets cost 10p. A portion of every ticket price goes into the progressive jackpot. Tickets cost from € 0.50. You can buy up to 60 tickets. Open All Hours - the progressive jackpot is offered by WinkBingo All Day at OPEN ALL HOURS and After Party bingo rooms. Tickets cost from 5p and you can win 5 jackpot prizes in 15, 38, 47, 56 and 62 calls. The jackpot starts at 500 credits and increases until someone wins it. Simply bingo on the 'Diamonds are Forever' pattern within 34 calls or less and win that games Jackpot! When the Progressive Jackpot is won, it will then start from $/€/£500 again (based on your currency). • 1. Every Monday, Tuesday, Thursday and Sunday from 18:45 to 23:45 every 30 minutes. • 2. Every Wednesday from 18:45 to 21:45 every 30 minutes and from 22:45 to 23:45 every 30 minutes. • 3. Every Friday from 18:45 to 20:45 every 30 minutes and from 21:45 to 23:45 every 30 minutes. • 4. Every Saturday from 18:45 to 20:15 every 30 minutes and from 21:15 to 23:45 every 30 minutes.